The dog days of August foretell not only the approaching school year but the end of the sweltering Las Vegas heat. Although I must say, from my perspective, this has not been a typically hot summer (maybe I just tolerate it better as I age). 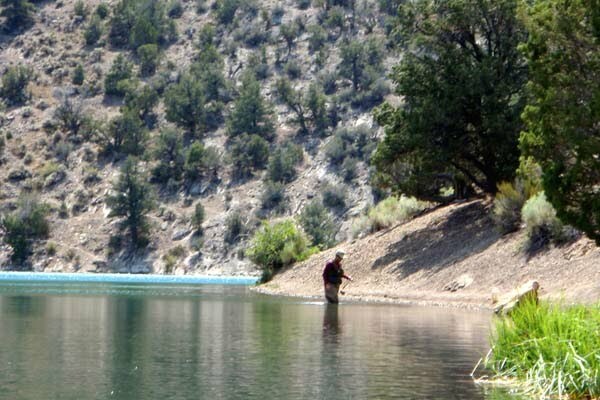 Still, getting away for a little fishing in northeastern Nevada surely bolsters my sufferance for 110 degree temperatures. 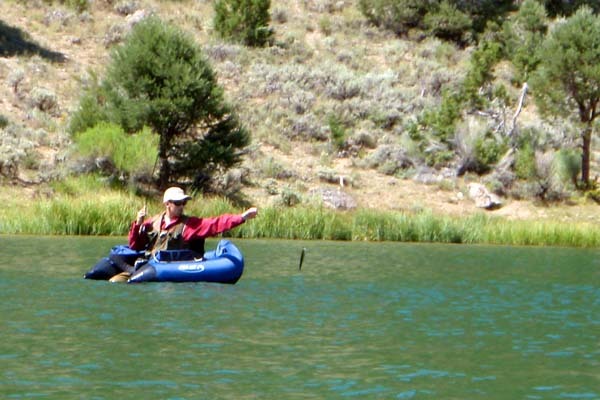 As I mentioned in my July 11, 2009 blog, my “number four son” Brian was developing an interest in fly fishing. Since just one week remained before he was to start his freshman year at UNLV we decided to make a “training” trip. 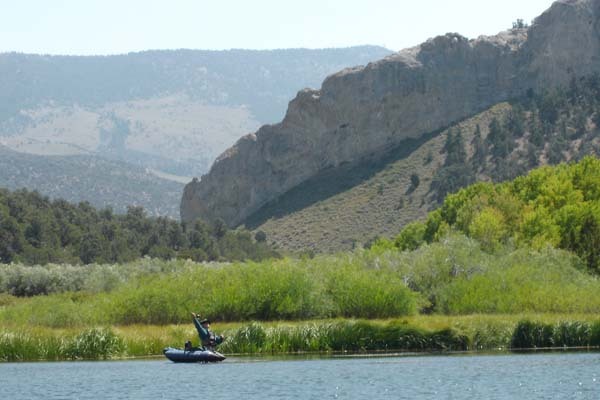 I selected Cave Lake mostly due to bad weather patterns over southern Utah, but also because I knew we would catch trout near the Cave Lake inlet (which I knew would also hold wild brown trout to feed my amusement). The downside to Cave Lake is the 240 mile two-lane highway that takes about three-and-one-half hours to navigate; it is surprising how much traffic it carries, especially freight trucks. Brian’s been on a pretty strict schedule all summer, including working his third season as a full-time YMCA counselor as well as a rigorous exercise routine (he’s getting very noticeable results) not to mention the end-of-high-school social activities normal for young adults preparing for college and new careers. We were both able to take a Friday off from work, departing Thursday night for Ely. 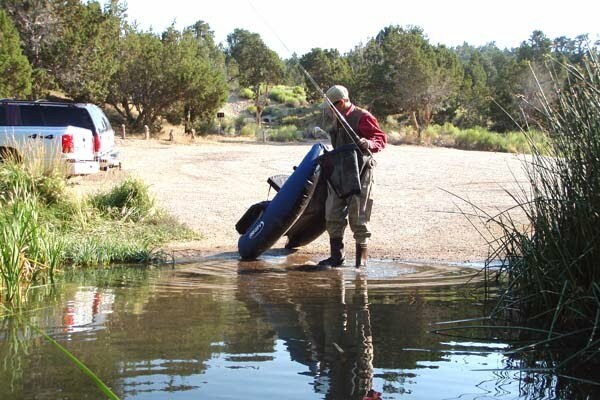 We planned to fish Friday morning to beat the weekend camping crowd and return home late Friday afternoon. On the return home, however, Brian noted we did way too much driving and too little fishing... a good observation from my point of view and the first really useful lesson to be learned. 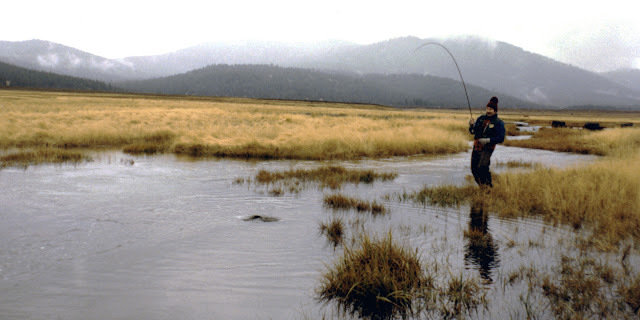 Brian had been practicing fly casting with an eight foot, five weight rod that I built in 1981. It’s a favorite rod for many reasons, some of which are sentimental (see my Henderson Springs blog). He was a little rough at first, but no more than any beginner trying to get down the timing and physics of casting a fly line. I also purchased Joan Wulff’s video on fly casting which helped (being self taught I really can’t describe very well what I do when I cast... 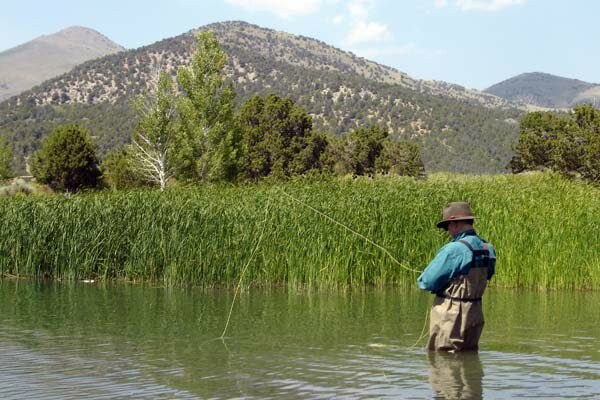 I sort of cast by feel since I’ve been fly casting for over thirty years). I was a little anxious for Brian when we got on the water because I knew he had a lower tolerance for frustration and higher expectations for performance... two conflicting traits when learning to fly fish. But truthfully, he did really well for his first time out. We launched the tubes near the inlet. It was already 8:00am and several families were fishing from shore, some from a rubber raft opting for the deeper water (fools). 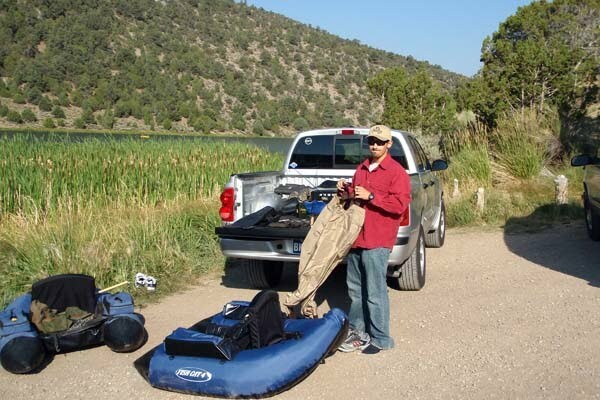 There also was a fly fishing float tuber getting out of the water as we prepared our equipment. When I asked how he did he only replied that it was cold. It was a curious response because it was not cold (65 degrees and climbing to a high of about 80 degrees), it was only 8:00am, and he did not answer my question which was obviously directed toward the fishing results not the temperature. I did not pursue the matter further because I assumed he had little success, and if that was the case I didn’t want his experience to cloud Brian and my expectations. I rigged up the old eight-footer for Brian with my favorite Galvan Torque fly real, and as for me I assembled my newly-built seven-and-one-half foot, four weight rod with my old Orvis CFO reel. I built the new rod for my birthday, purposely filling the gap between the little six-footer I made last January and the nine-footer I usually use when float-tubing large water. (In thirty-five years of fishing I’ve never broken a rod. 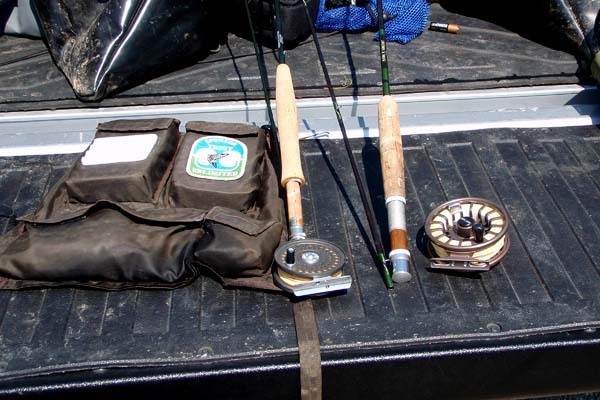 On this trip I brought four rods, the two I just described as well as two “store-bought” nine footers: a Fenwick and an early model Sage, both low-priced rods relatively speaking. I had all four stuffed in a rod tube. It was tight in the tube, so when we finished I had to pull the nine-footers out so I could slide all four in at once. Upon sliding out the nine-footers, both in rod bags, I caught the tip of the Fenwick on the zipper cap of the tube. The resulting sound I heard, despite being the first time I have ever heard it, registered in my brain as a broken tip. Sure enough, when I opened the rod bag I had snapped two inches off the Fenwick tip. The Fenwick was my favorite nine-footer. After the initial disappointment wore off I realized that for the same $150 I paid for the rod I could build a custom replacement... smile). Brian had the usual beginner difficulty. Mostly he was breaking his wrist on his back cast causing the rod tip, and therefore his line, to dip too low. This resulted in the line slapping the water on his back cast. The other beginner’s frustration was timing on his forward cast. Obviously, you can see the line in front of you so timing the start of the back cast is easier as you naturally watch the line roll out in front of you. 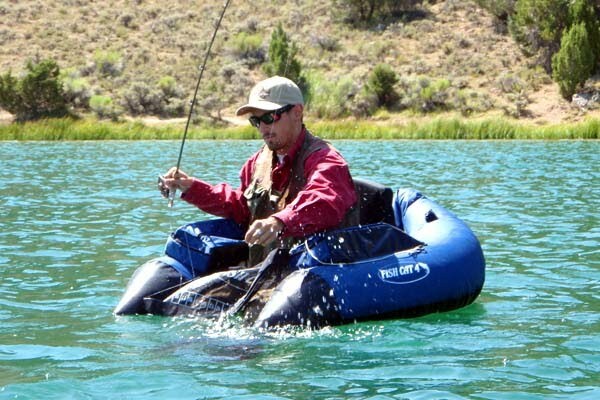 Since you don’t see the line behind you unless you purposely crank your neck around, starting the forward cast is more problematic, even for experienced fly casters. Usually what happens to beginners is that as the line begins to extend out behind them they start the forward cast too early, i.e., before the line rolls out and loads up the fly rod. Starting too early can cause all sorts of ugly problems, one of which is the whipping action that all too often snaps off the fly. Brian lost several flies on Cave Lake. But you know, remembering back to my early learning years, he didn’t lose more flies than I did back then. 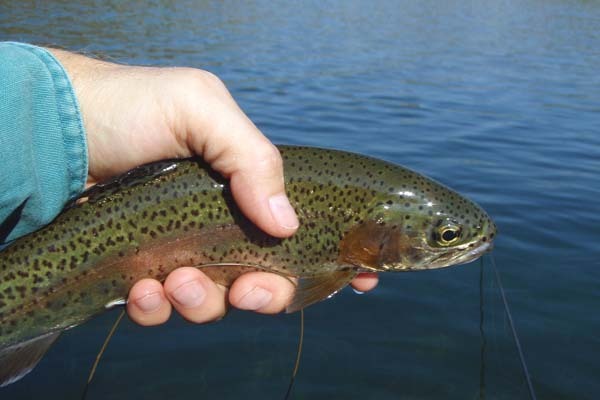 But best of all, Brian caught eight rainbow trout. Darn good for a first time fly-fisherman! That, of course, is the purpose of fishing. 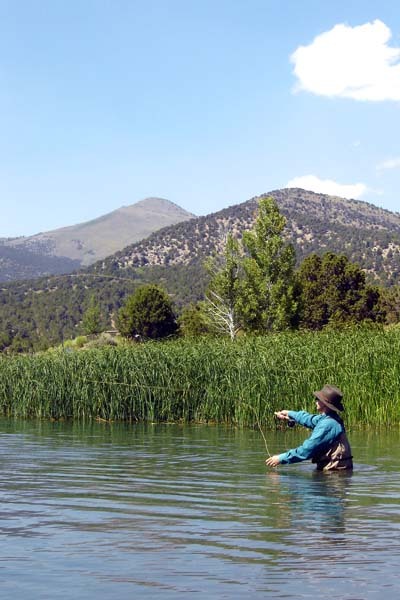 Yes we love the outdoor scenery, the tranquility of nature, the rhythmic dance we do with the fly rods, but don’t kid yourself; we fish to catch fish. I thought Brian’s performance was really excellent for a beginning fly caster. His largest was about twelve inches. 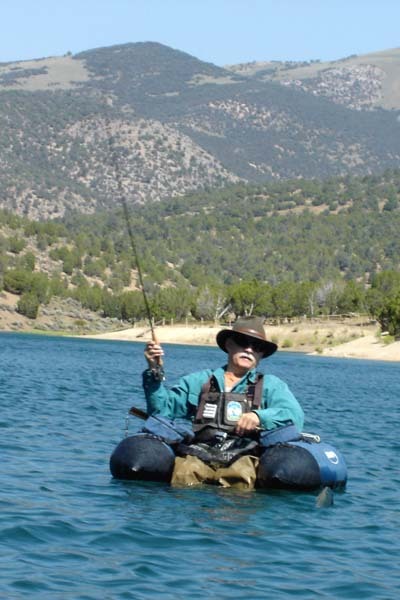 I was amused by the little issues he experienced that I had erased from my early memories, like how do you bring the trout to your hand while sitting on a float tube; just little things you take for granted after years of experience that seem so obvious to me now (doesn’t everyone in the world know how to land a trout by hand while sitting in a float tube?). Watching Brian experience and figure them out on his own brought back memories of fishing with my brother Neal. And, he tied all his own knots, which is a very good thing when you’re losing flies on your back cast. As for me, I had a blast with my newest four-weight rod. I knew the wild brown trout would be in the shallows near the inlet. Although I did not count fish, I’d guess I caught something more than fifteen. 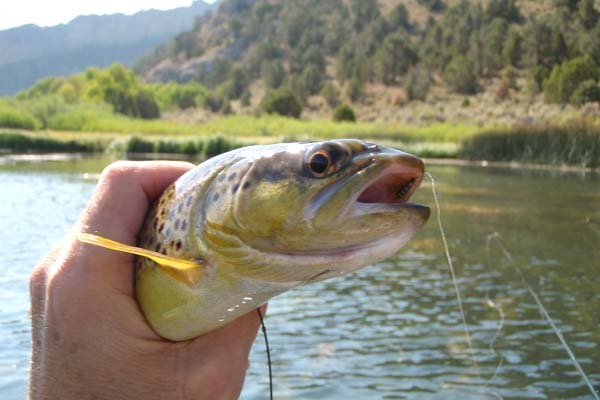 About six were brown trout, two being right at fourteen inches. The seven-and-one-half-foot rod blank I used for this rod was the same Cabela’s PT Plus model I used for the six-footer, and I’m really pleased with the way both of these four-weights cast. I think I’d like to return in the fall with both of them and try for the browns while they’re in the full spawning mode. Once again the time spent driving with Brian offered wonderful opportunities to talk. Not that I live with regrets, but I wish I had made more opportunities to have long, casual discussions with Brian’s older brothers when they were formative teenagers. Some of us parents mistakenly think quality time trumps quantity, but I’m convinced it’s a misleading theory. There is something that compels conversation when you’re trapped together in the cab of a truck, a walk in the outdoors, or an evening at dinner. While I don’t think words speak louder than actions, conversation puts the meaning and context to them. Sure, mom and dad have been married thirty years, but they’ve had lots of rough spots that have sunk similar marriages. Having the time to discuss those difficulties and the journey through them with the love, grace, and hope of Jesus helps explain the source of the actions in which marriages survive and even flourish; love of each other simply isn’t enough when you’re struggling and hurting due to your selfish desires. After all, we’re all sinners who the evil one wants to kill, steal, and destroy, and so we’re in need of our own 12 Step program for sinners, aren’t we? Maybe there’s a 12 Step for Fishermen Anonymous? !